This page will talk about the solution for C drive increasing when it runs on low disk space on Windows Server 2008. Download IM-Magic Partition Resizer Server to reallocate disk space for C drive on Windows 2008, SBS 2008 and Windows 2008 R2. When C drive is running out of disk space on Windows Server 2008, do you want to reallocate disk space? You can use partition software to reallocate disk space without repartitioning hard disk or deleting any data. IM-Magic Partition Resizer Server is a partition tool which enables you to increase size of C drive on Windows Server 2008, SBS 2008, Windows Server 2008 R2 and other Windows Servers. This partition software can be compatible with all brands of hard disks to perform partition resizing. You can follow the steps below toresize disk partition Windows server 2008. "I want to reallocate some disk space for C drive on Windows Server 2008, but I can only shrink some unallocated space under Disk Management. The extend volume option is grayed out when I want to add the unallocated space to C drive. Can anybody tell me how to resize C drive on Windows Server 2008?" "C drive is running on low disk space on Windows Server 2008. How can I resize hard disk without losing any data or installing system? 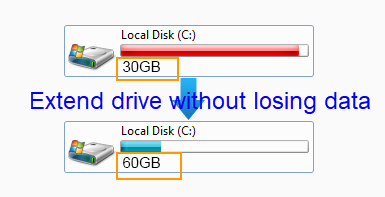 There is another partition D drive on my computer which still has much free space, so I am wondering if I can move some free space from D drive to C drive. If possible, can you tell me how to do it?" Truthfully, it is possible to resize hard disk on Windows Server 2008 under Disk Management, but it has some limitations when you want to rely on Windows built-in Disk Management to resize disk space. When Disk Management failed to extend volume, you can use professional partition software IM-Magic Partition Resizer Server to perform partition resizing. This partition software enables you to shrink partition to create some unallocated space and then allows you to add the unallocated space to C drive so as to get it extended. As long as there is free space on the same hard disk, there is no limitation to reallocate disk for C drive by using this partition software. IM-Magic Partition Resizer Server also works on Windows SBS 2008 to extend C drive space. You can rely on this partition software to increase size of C drive in SBS 2008 with operating system and original data untouched. This partition software supports NTFS and FAT32 file system. By using this partition software, you can extend C drive without rebooting PC or reinstalling system. Therefore, it is time-saving by using this partition software to perform partition resizing. If you computer shuts down or reboots due to unknown reasons in the partition resizing process, this partition software does not have any influence on the computer or disk data. 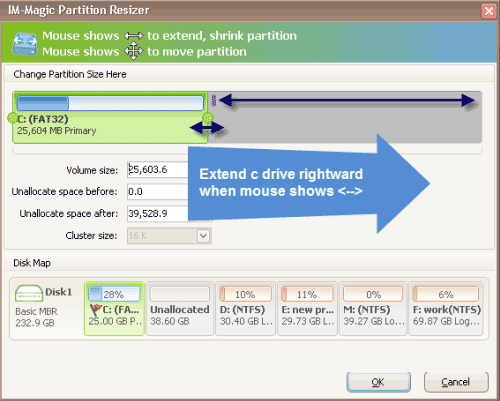 IM-Magic Partition Resizer Server is able to work on RAID 5 to extend C drive space. If C drive runs on low disk space on Windows Server 2008 RAID 5, you can run this partition software to move free space from another partition on the RAID 5 to extend C drive. This partition software enables you to extend C drive on RAID 5 without touching any data or hurting operating system. If there is no free space on RAID 5, you can also add new disk to extend the RAID 5 partition. When adding new disk, you should make sure that the new disk can be compatible with the RAID 5 array. If you can use this partition software to resize RAID 5 partition, you do not need to waste time rebuilding array and backing up data.